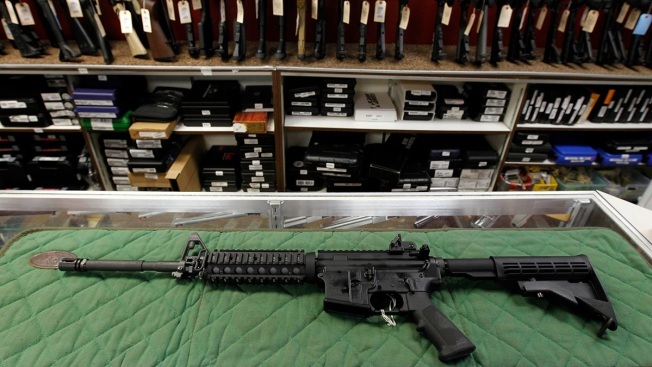 In this Thursday, July 26, 2012, file photo, an AR-15 style rifle is displayed at the Firing-Line indoor range and gun shop, in Aurora, Colo. A new poll shows a majority of Americans favor stricter gun laws, and most believe schools and places of worship have become less safe over the last two decades, according to a poll conducted by The Associated Press-NORC Center for Public Affairs Research both before and after last week’s mass shooting at two mosques in New Zealand. A majority of Americans favor stricter gun laws, and most believe places of worship and schools have become less safe over the last two decades, according to a new poll conducted by The Associated Press-NORC Center for Public Affairs Research. The survey was conducted both before and after this month's mass shooting at two mosques in New Zealand. It found that 67 percent of Americans support making US gun laws stricter, while 22 percent say they should be left as they are and 10 percent think they should be made less strict. The New Zealand shooting on March 15 did not appear to have an impact on Americans' support for new gun laws; support for tighter gun laws was the same in interview conduct before and after the shooting. While a majority of Americans have consistently said they support stronger gun laws, proposals have stalled repeatedly in Congress in recent years, a marked contrast to New Zealand and some other countries, such as Australia, that have acted swiftly after a mass shooting. Less than a week after the mosque shootings, New Zealand moved to ban "military-style" semi-automatic weapons and high-capacity magazines; similarly, after a mass shooting in 1996, Australia enacted sweeping gun bans within two weeks. The new poll suggests many Americans would support similar measures, but there's a wide gulf between Democrats and Republicans on banning specific types of guns. Overall, 6 in 10 Americans support a ban on AR-15 rifles and similar semiautomatic weapons. Roughly 8 in 10 Democrats, but just about 4 in 10 Republicans, support that policy. In contrast to New Zealand, the United States has enacted few national restrictions in recent years. In part, that's a reflection of gun rights being enshrined in the U.S. Constitution; in a poll by the Pew Research Center in spring of 2017, 74 percent of gun owners said the right to own guns is essential to their own sense of freedom. That poll also found that gun owners were far more likely than those who don't own guns to contact public officials about gun policy or donate to organizations that take a stance on the issue. A divided Congress after last year's midterm elections only serves to make any new national gun laws unlikely for the foreseeable future. Overall support for stricter gun laws is unchanged since an AP-NORC poll conducted one year ago, a month after the school shooting in Parkland, Florida, that left 17 people killed. The post-Parkland poll marked an increase in support for stricter gun laws, from 61 percent in October 2017. Charlene Bates, who works in the library at a high school in Idaho, said she believes a combination of factors has made schools less safe than in the past. Mental illness, parents who aren't as engaged in their kids' lives, social media and violent video games are among the reasons she cites for gun violence in schools. "There are a lot of kids that you're just unsure about, they're kind of unstable," said Bates, 46, from Pocatello, about 235 miles east of Boise. There are some students who are quiet, keep to themselves and she wonders if they're "like a bomb waiting to go off. ... I think that's what scares me the most." While Idaho is one of the safest places in the United States, she sees coverage of mass shootings and violence elsewhere in the United States and around the world. Her school's resource officer conducted some training recently and "he said it's not if, it's when. This is very likely to happen even in our community." "We aren't isolated," she said. When it comes to places of entertainment, the public has mixed views. Nearly half consider concerts to be less safe than they were, and about as many say the same of bars and restaurants. Fewer — roughly a third — say sporting events have gotten less safe. While many consider public transportation systems to be less safe, about a third of Americans say airports have gotten safer over 20 years — likely a reflection of the stepped up security since the 9/11 terror attacks. The AP-NORC poll of 1,063 adults was conducted Mar. 14-18 using a sample drawn from NORC's probability-based AmeriSpeak Panel, which is designed to be representative of the U.S. population. The margin of sampling error for all respondents is plus or minus 4.1 percentage points.